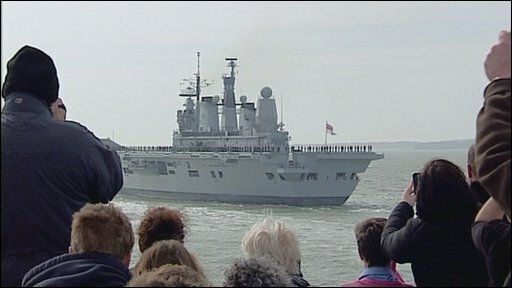 The Royal Navy's flagship HMS Ark Royal has left Portsmouth to lead a series of multi-national exercises. An international task group called Auriga 2010 will be carrying out exercises in the North and West Atlantic Ocean between May and August. The exercises are designed to show the UK's capabilities to keep a task force at sea for a prolonged period. The French submarine FS Perle and US destroyer USS Barry are also taking part. The 20,000-tonne aircraft carrier will also be joined by Devonport-based Type 23 frigate HMS Sutherland and Royal Fleet Auxiliary vessel Fort George. Portsmouth-based Type 42 destroyer HMS Liverpool will leave on 10 May to join the task group. A Royal Navy spokesperson said: "Auriga 2010 will demonstrate the UK's ability to deploy, operate and sustain a task group out of area for a prolonged period. "The ships will also undertake a series of goodwill port visits in the region to support International Security Co-operation initiatives."